Hey guys, first time posting in the design forum, but I'm hoping I can get a little help with a component issue. I'm designing a game of resource collection and investment with a fantasy theme, so you have adventurers (up to 15 per player w/ up to 4 players) that go on these quests and level up, from level 1 to level 4, and at level 4 they also can gain one of 12 different titles that impart some advantage in the quest-taking process. The adventurers are also moved around a lot, so whatever way I implement to denote level and title also needs to be fairly durable (i.e. not sliders or tokens that you just lay on top of them). My current idea is to have 1.5cmx4cm cardboard tokens for the adventurers with a 1cm diameter hole cut out at the bottom (but still fully enclosed by the cardboard - and the width of the piece at the bottom may be larger to increase durability), and then there would be 1cm circular tokens that could be placed in the hole to denote level or title. My main concern with this method is the regularity of the 1cm circular cut so that all tokens would fit tightly in the hole and wouldn't fall out when moved around. I'm most likely going with Panda GM, as I have heard their methods are high quality. I guess what I am asking of this community is whether this method sounds like it will work, or if someone has a less fiddly (but still cost-effective, i.e. no custom plastic pieces) solution, I would love to hear that, as well. Thanks! Or for even more sturdiness glue a 2nd card underneath so the chips can only be removed from the top (though you'll need to redesign the hole to make it easier to remove them). Perhaps something like Lego blocks? The adventurer token could set in a plastic frame (or be a plastic figure itself) and then levels and other status be added underneath. Hmm, that's true. There was a similar design in Tokaido. I'll have to get my hands on a friend's copy and see how well it stands up to being moved around. Thanks! Other alternate designs will still we welcomed with open arms. Here is a solution I used for a school project for a game involving leveling gladiators. This shows pieces at lvl 0, 1, and 4. Your concern about consistent hole size is covered by making sure you choose a washer size that fits over your small dowel. The dowel should be the same width for its entire length (if not, don't buy it). For assembly it helps if you have access to a drill press and a vise is pretty essential. Obviously you'll need a saw and glue (and paint if you so desire). Cut the dowels into sections based on whatever works for you. For the small dowel I made it a little longer than strictly necessary so there would be a little handle to easily move the piece around. Next you'll want to drill a shallow indentation in the middle of the thick dowel pieces. This may not be strictly necessary, but it makes gluing in the handle MUCH easier, and makes the piece as a whole far sturdier. Glue in the small dowel. You could paint some of the washers too to differentiate between levels and titles. Jordan, that looks really cool. I love the dimensionality of them and they look really easy to move around. Unfortunately, I'm looking for a cheap, mass-produceable solution, but...well, actually, I might be able to modify the design. 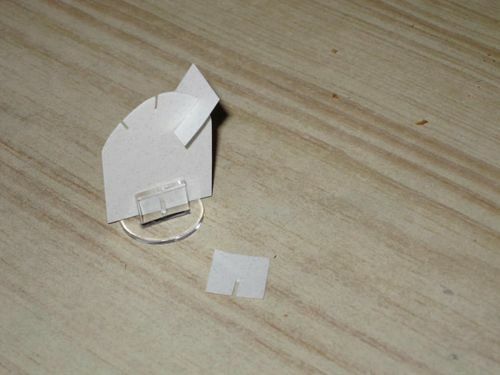 If there were a cheap way to make some flat plastic pieces with some sort of protrusion, you could put a cardboard marker with a hole in it on top of the plastic piece and it wouldn't slide around. Something to look into. Thanks! The paper should be thick enough and the cuts should have the right width. If these requirements are met you get a cheap but solid solution. Something like this: http://www.fastenercomponents.com/products/square-base-with-... perhaps? Thanks for all of your ideas. I especially like Martin's solution. I will check to see if slots can be easily cut into the cardboard.